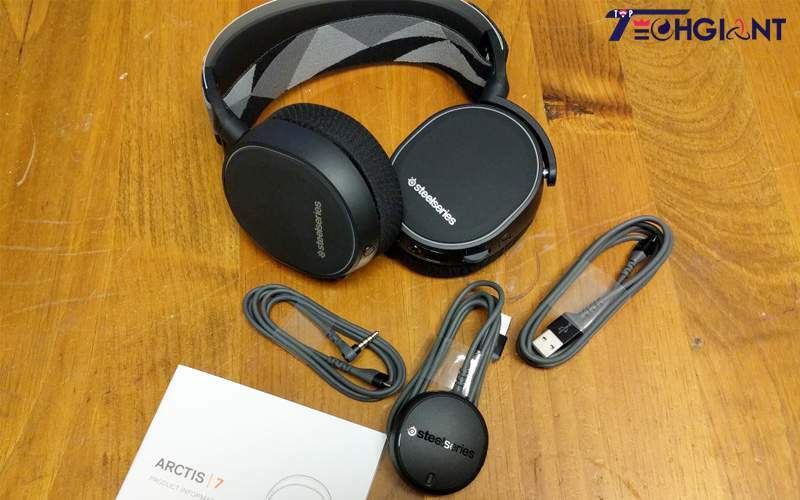 The SteelSeries Arctis 7 is a wireless gaming headset that is one of the top gaming headsets around and one of the major products from the company’s Arctis range of headsets. It offers users a reliable wireless audio functions. Its design and other qualities will be discussed. I liked the look of Arctis 7 from the moment it emerges out of the box. If you are not a fan of flashy products, then you might appreciate the “mature” look of this headphone. Many users have shown their love for it because it has a modular design that is versatile and can be used with PCs, Macs, your favorite game consoles, virtual reality box and even on mobile devices. Another thing I liked about this headset is that it is not made from cheap materials such as angular plastic moldings, a combination of bright and flashy colors aggressive logos, etc. The SteelSeries provides the Arctis 7 in white or black, and both designs are simple and also unobtrusive. The black version which I received for the reviewing of the product features a black matte surface, and a Silver SteelSeries logo was printed outside each earcup. 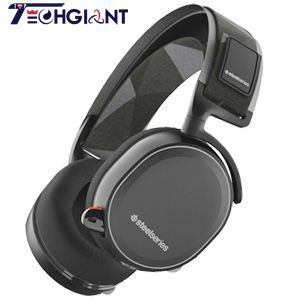 When I tried it while playing the Sleeping Dogs and Battlefield 3 on my PC, the sound was great and pretty dynamic with the 7.1 Virtual Surround enabled. It has a pretty expansive soundstage, with sounds coming from every direction, both right and left, front and back. For cross-platform gamers, the wonderful 7.1 surround sound is available only on PC; consequently, you’re stuck with stereo sound on PlayStation, Mac and Xbox, and smartphones. The wireless lag-free audio claim is true. I did not notice any lag during the test, whether with stereo sound or the 7.1. I gave this Arctis 7 to a fellow gamer, and he found it very comfortable. While he wasn’t too comfortable with the snug which to him was too close at first, he was surprised how the headset fit on him after adjusting it, using the ski goggle band. He also mentioned the lightness of the device as an advantage which I like too, and the device weighs only about 9.9 ounces. As mentioned above, the ski-goggle band allows for comfort, making it easy to find a perfect fit for your head with the Arctis 7. 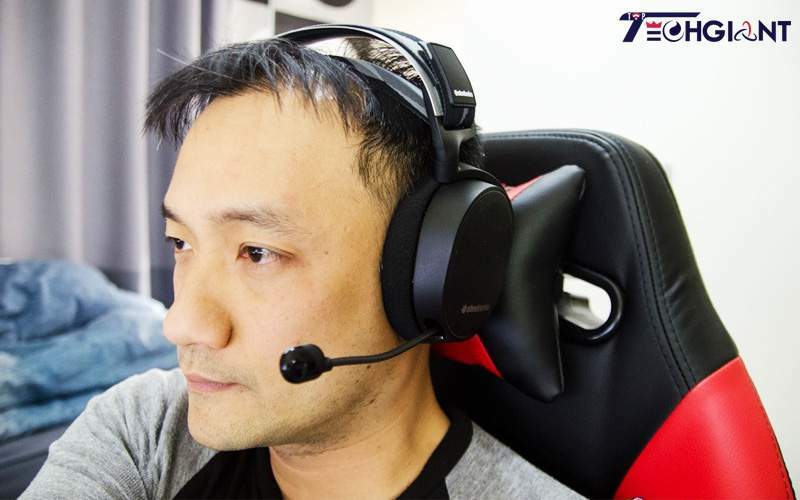 It is surprising to know that only SteelSeries has adopted this approach among the major manufacturers of headsets, and it constantly provides more reliable results and is more comfortable and convenient for the user. Around my ears, the ear cups create an airtight seal, yet I never felt the feeling that the cups were pressing too hard on my head. What I did not like was that it was somehow shaky while I walked, which meant it could be frustrating if you are thinking of putting on the headset while walking when not on your PlayStation, Xbox or PC. Although tightening the Velcro solved this problem, trying to get the perfect balance for your head size might first require some trial and error. The Power button is housed on the right earcup as well as the chat volume control. The regular volume control is on the left ear cup, including a micro USB charging port and a dedicated port which can be connected to any 3.5mm. The audio jack can be very useful if you want to use the headset with a mobile device or any other device other than your PC. I appreciate that apart from the wireless function, the Arctis 7 also allows you to listen to anything you want by using the audio jack, whether the device is being powered by a battery or not. The Arctis 7 comes with a 40mm driver which powers each speaker. At a volume of 50%, most of the ambient noise becomes inaudible, but when the earcups are fairly compact, they can allow some ambient sounds in. The product features a ski goggle band which is wrapped around the metal headband and stretches to provide a comfortable grip on the head. The Velcro fastener allows you to adjust the fit as you want and even provides enough bandwidth for larger heads. And you might have to adjust the Velcro so that it can hold on and create enough room for convenience. However, the headset adapts perfectly and feels very light due to the suspension of the ski strap. The relaxed fit allows great comfort during long play sessions and may allow you wear glasses with your headset without the glasses pressing hard on your temples. However, due to the adjustment of the ski-goggle band, small, thin heads may also find the Arctis 7 quite loose and free. The Arctis 7 is built with a40mm driver which powers each of the speakers. At a volume of 50%, most of the ambient noise becomes inaudible. But when the earcups are not compact, they can allow some sounds in. Like the wired counterpart of the Arctis 7, this wireless version offers great gaming options. With the stereo surround sound and DTS 7.1, as well as an unlimited number of equalizer options. You can get a wide range of very different headphone configuration settings; it doesn’t matter whether you’re listening to music or you are going to make a Skype call or video chat. I like how simple the setup for the game profiles is. With the SteelSeries Engine 3 software, you might create several EQ and surround sound settings, create desired profiles, then connect them to your games and several programs. I tried the sound profiles with The Witcher 3: Wild Hunt, Overwatch, StarCraft II: Nova Covert Ops, and even Marvel Heroes just to see how the headset handled the multiple genres available to me. With the flat EQ and the stereo audio, everything on Captain America sounded good. I tried it while playing Captain America, and I liked the sound of the battle cry. However, you might need a minor tweaking, which made everything feel perfect for me. If you don’t like this, you can take a look at TopTechGiant’s top 11 best gaming headsets. You may also enjoy this Arctis 7 with your PS4 or Xbox One, just by connecting the audio jack to a controller. The PS4 works wirelessly using a USB dongle. While you have to sacrifice surround sound options, the device still has good sound, and the microphone is wonderful for a competitive multiplayer game. I think everything depends on your degree of interest and how much you desire comfort. SteelSeries has an extremely comfortable and a supremely stylish headset in the Arctis 7. If you care for comfort and ease of use of a plethora of options and functions, this device might be what you need. Best Fitness trackers and watches in 2019, You can Go!